As a young girl, I used to adore beauty pageants and watching Miss South Africa was an annual delight for my family and me. Fast forward to March 2012, at my first ever international women’s day event at work, and Miss South Africa 1992 Amy Kleinhans was the keynote speaker. I remembered her from my years of following Miss SA pageants, but beyond her face and her name, I didn’t know much more about her. While listening to her speech I was entranced by her story, and I developed a new perspective on what Miss SA meant during her era. At age 24, Amy was the first Miss SA of colour, and this was during a year when South Africa’s international sanctions were being lifted, white South Africans had voted in favour of ending apartheid in a referendum, and negotiations about the future of the country were being held against the backdrop of significant politically motivated massacres in our country’s history. It was a tense and uncertain time to be an ambassador for the country. But simultaneously, as the first Miss SA of colour, Amy was bound to have a strong stance on the state of the country. One of the defining moments in her reign was her refusal to wave the old South African flag during the international procession at Miss World- which sparked an array of positive and negative reactions from the public and the press. Nonetheless, there was no questioning her politics and she was unapologetic. This year, I had the opportunity to speak at the Cell C Take a Girl Child to Work Day event. Since I have not followed Miss SA in many years, I was unaware that I would be sharing the stage with the Miss SA 2nd Princess- Boipelo Mabe. When I met Boipelo I thought she was strikingly beautiful and, I was intrigued by her passion for current affairs and her career as a political analyst in broadcasting and media. But, when I listened to her share her personal journey with such authenticity, my appreciation for her grew much deeper. Boipelo is from very humble beginnings- she is the daughter of a taxi driver and as a child lived in a small shack built by her father in Ivory Park. Growing up under these circumstances would inevitably lead to feelings of shame and inadequacy, especially compounded by teasing and social pressure from others. But despite this, she performed exceptionally well academically and pursued a modelling career which led her to the Sun City Super Bowl. 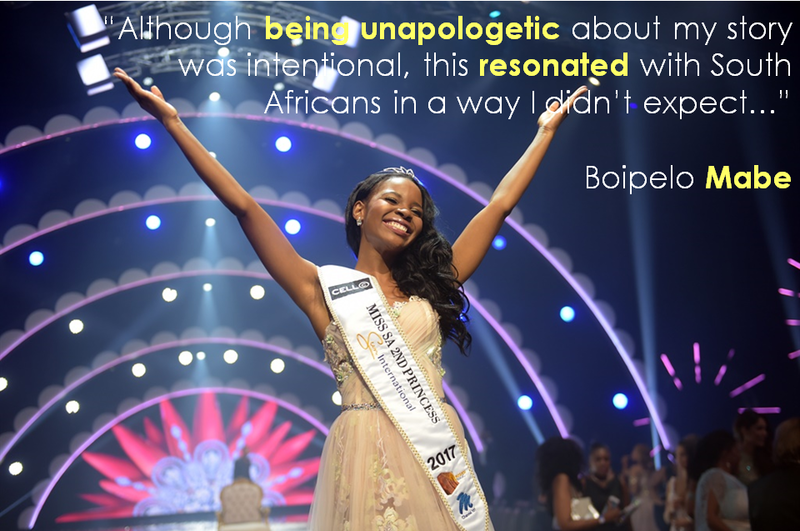 One of the defining moments in the 2017 pageant was when Boipelo spoke frankly about her personal experience of generational poverty and how she had to overcome the fear of not being able to achieve her dreams because of her family’s social status. Boipelo was not only speaking her own truth but the truth of the poor black youth who still dares to dream, 41 years on from Hector Pieterson’s murder. At that moment, there was no questioning her politics and she was unapologetic. In celebration of Youth month, we celebrate Boipelo Mabe. MG: Let’s flash back to before the Miss SA pageant- seemingly you were already a mover and shaker at a tender age- you had a profile in the media as a current affairs reporter, you had a modelling career, you were enrolled for a Masters in International Relations, you were active in the Alex community. Why did you decide to enter the Miss SA pageant? BM: A lot of the major decisions I make are calculated and my entering of Miss South Africa at that stage of my career was nothing short of that. I really was enjoying my work but knew that I needed a little something ‘extra’ to really tap into the full potential of my skills and what I was exposed to. I believed that Miss South Africa provided that platform to firstly challenge myself on a personal level and to share my work on a broader platform, with a wider audience. It was an opportunity for me to effectively expand my network, knowledge and personal brand. Looking back, I am so happy and proud that I did it, I gained more from it than I had thought. MG: What do you think ultimately made you stand out throughout the pageant? I imagine other contestants were also very talented and wanted the crown just as badly as you. BM: My fellow contestants were such incredible women and I still draw a lot of inspiration from my engagements with each of them. They brought so much more to the pageant than just beauty. We all came with different motivations and strategies to the pageant and I believe what made me stand out was my openness about my personal story, background and journey that I unpacked right from the beginning. It was a continuation of what I had started even before the pageant when I began my media career and I simply used the pageant platform to refine and share it with more people. Little did I know that it would not only reach many people but that it would impact many more on a very personal level. My story of being raised by taxi driver, growing up in a township and rising above ‘inherited’ hardships along the way to achieve my dreams seemed to have resonated with South Africans in a way I did not expect. MG: What’s next for you? You’ve mentioned wanting to focus on moving on from the pageant and trying new things in your career. Does this mean we should expect to see you on CNN quite soon? BM: Haha, I think at this point one is inclined to say that “big things popping” and without a doubt ‘BIG’ is where I want to go with my career. However, I am very careful not to rush it as I want to build a very solid foundation for myself where the big stuff will be planted. With that I mean that I am allowing myself to go through the process; learn as much as I can, go under the radar when I need to, explore and grow ‘organically’. So next for me right now is firstly continuing with my studies, I’ve suspended my Masters in International Relations and I have registered for a Management Development Programme at a Business School. I want to be able to manage my brand as a business and understand the technicalities behind a successful organisation. I’ve also joined the corporate space, something very new and exciting for me. I am really just allowing myself to experience as much as I can and investing in myself along the way. MG: I really respect how you are young and very engaged in current affairs and international relations. It reminds me of Eusebius McKaiser, who has said that he knew he wanted to change the face of political and social analysis and prove that it didn’t only have to be an older, white, male professor who had the most prominent voice in these debates, and that a younger, black person with an equally prominent voice could provide a nuanced perspective. Considering your background and humble upbringing, do you see yourself being as conscious about your public voice? BM: Absolutely! And I believe my journey in Miss South Africa proved that. Sharing my story in the way that I did and being unapologetic about it was an intentional exercise of my public voice. On the crowning night of the pageant, I mentioned the experience of generational poverty– an issue that has never been raised in that manner on that kind of platform before. As a young black woman, I believe I have a responsibility to exercise my public voice, not only for me but for other black women especially those younger than me because there are still many ceilings in society that need to be broken. Furthermore, I want to be a relevant voice in my generation thus education and keeping up with what is happening around the world from various perspectives is important to me. This is why I truly value learning, whether it be reading, a conversation with someone who has more experience than I do etcetera. Knowledge is power! MG: I imagine the last 12 months have been a whirlwind and also tested your character in new ways. What have been some of the challenges and lessons you’ve learnt from them? And, what’s the best advice you’ve received that’s helped you cope with your success? BM: The biggest challenge was living with expectations of a title I had never had to deal with before; the expectations from loved ones, the community and the public at large; the assumption of instant success. I first had to acknowledge that the race was still mine and no one else’s and just had to trust the process and trust myself. At the same time, I had to acknowledge that that’s what the titles come with and to a certain extent, I had to be understanding of people’s reaction to my success to. That’s where I saw the power of humility. The best advice that I’ve received is that given any circumstance in life, I always have a choice and that it’s up to me to make life better or worse for myself by what I choose. I always keep that in mind. Boipelo’s story reminds me of the quote “we are we are the ones we have been waiting for.” It’s often an easy choice to look outwards for validation, direction, hope, identity, blame or pity, but looking inwards and being truly comfortable with yourself is a big step on the path to self-mastery. Challenge yourself to be unapologetic. Lovely and inspirational post! I’m looking forward to reading more! Tonye ?